The 24-year-old Japanese victim was found in an unresponsive state shortly before 9am on Avenue Road. 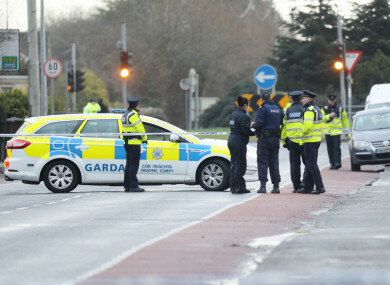 IT WAS IN a quiet residential area of Dundalk, Co Louth, that a young Japanese man was killed and two other men were injured as locals made their way to work this morning. The 24-year-old Japanese victim was walking along Avenue Road when he was stabbed, shortly before 9am. He was found in an unresponsive state and was pronounced dead at the scene. Two other men, both Irish, were attacked with a fencing pole shortly afterwards at two nearby locations – Inner Relief Road and Seatown – and by 9.45am, gardaí had arrested the suspect. An 18-year-old man from Egypt has been arrested over the incident and is being held at Dundalk garda station. Local Fianna Fáil councillor Emma Coffey, who lives just minutes from the scene of the fatal attack on the young Japanese man, told TheJournal.ie that residents are “trying to digest what has happened”. One thing I’m glad of is that the schools were off because there would be a number of secondary schools and primary schools in the area that people would have been going to at that time of the morning. It’s an absolute tragedy what happened – three people, one lost his life and two injured, I just feel so sorry for that poor young man, may he rest in peace. The two local men who were attacked – one believed to be in his early 20s – did not sustain serious injuries. She said she wanted to commend local gardaí for their quick response and “extreme bravery” in dealing with the incident and preventing further injury or loss of life. Ruairi Ó Murchu, a Sinn Féin councillor in the area also praised the bravery of the local officers. “It was unarmed gardaí who took him down after what he had done and you can only be, for want of a better word, in awe of that,” he said. Fine Gael councillor Maria Doyle said there has been a “sombre mood” around Dundalk town today. She also pointed out that children would have been on their way to school at that time if the attack had occurred a week later. It’s a difficult thing to explain to children, I was passing the crime scene with my own children on the way to a birthday party earlier. The place where the Japanese man was killed is on my walking route that I take in the evenings, and just when somewhere is very familiar to you it’s more shocking to think you could be caught up in something so random. Although gardaí on the ground have been praised today for their response to the attack, Fianna Fáil TD and the party’s justice spokesperson Jim O’Callaghan said it is worrying that the authorities are unable to determine how the young Egyptian man entered the State. “Minister for Justice Charlie Flanagan needs to clarify as to what extent this person was known to the authorities, what his status in the country was and whether he travelled to another EU country prior to his arrival in Ireland,” he said in a statement. At a press briefing this afternoon, investigating gardaí said a motive for the attack has not been established. They confirmed that terrorism is one line of inquiry. Chief Superintendent Christy Mangan said gardaí are working to establish why the 18-year-old was in Dundalk. The assailant is believed to have been applying for asylum in Ireland. Gardaí became aware of his status in the country on 1 January but said there was no reason to believe he was dangerous. Gardaí are appealing for witnesses to contact Dundalk Garda station on 042 938 8400, the Garda Confidential Line on 1800 666 111, or any Garda station. They are particularly interested in anyone who was in the Avenue Road area shortly before 9am, or on Coes Road or Seatown Place or the Inner Relief Road between 8.30am and 9.40am. - With reporting from Garreth MacNamee in Dundalk. Email “'It's the randomness of it that's frightening': Dundalk stunned by fatal stab attack”. Feedback on “'It's the randomness of it that's frightening': Dundalk stunned by fatal stab attack”.